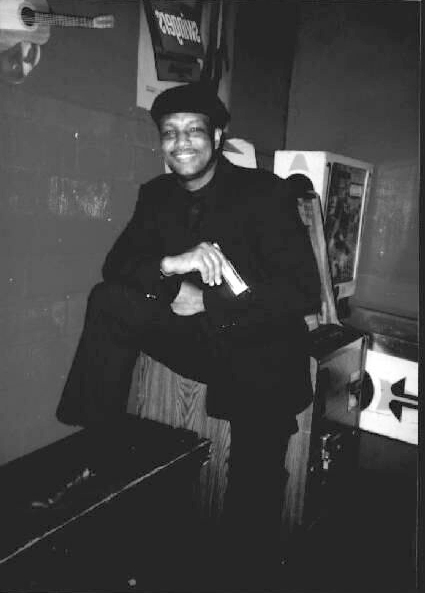 An extensively experienced singer, harmonica and saxophone player, Mel Davis is one of the most authorized and active living links between the East Side blues tradition in Austin and its current live circuit. Like many of his counterparts, Davis’ career grew out from a musical family and community environment where he could naturally absorb the richness of black music’s tradition. 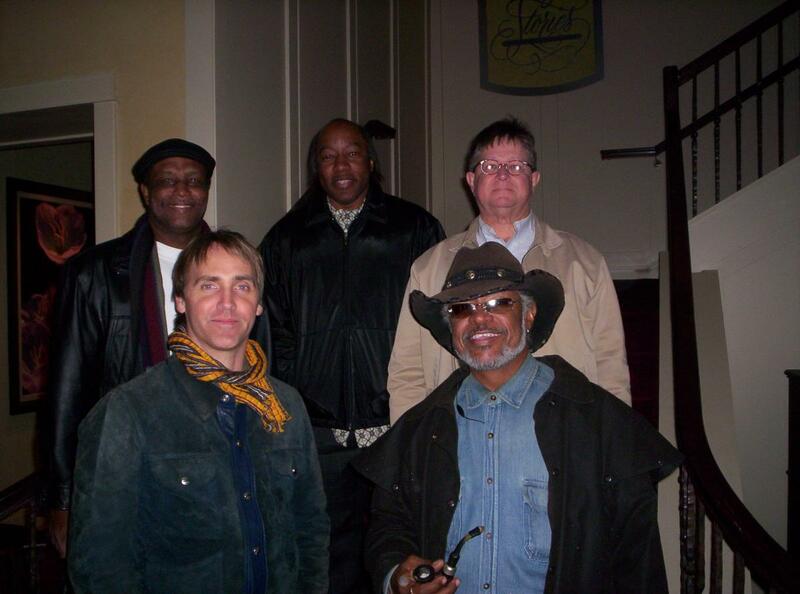 Particularly installed in the Texas gospel-blues-jazz axis, Davis has performed and recorded with local legends T.D. Bell and Erbie Bowser –who contributed to shape Austin’s postwar blues, and continues to spread their legacy as the current frontman of The Blues Specialists. A band established by Bell and Bowser in 1987 after a period of retirement, The Blues Specialists –which also count with Bell’s son Lawrence on Hammond, have been showcasing their blues weekly for twenty-five years. Every Friday you can find them at the Continental Club, which, situated in the South Congress neighborhood, remains one of Austin’s most historical and well-known venues. Currently, the band draws on a tightly relaxed, jumpy beat that comes out as a laidback, groovy invitation to enjoy their music and delivery. A cousin of Texas blues electric father T-Bone Walker, Mel Davis’ style shines elegant and cool, and offstage he reveals as a spontaneous and talkative character, determined to keep on talking his lively blues to many audiences. I learnt everything by ear. I listened to tons of music. When I was five years old I started listening to the blues. In Houston, that’s where I’m from, I started listening to the blues in 1949 so I can go way back up the way to the current time. And I love the music. I’ve been playing harmonica since I was 8 years old. It’s been about 50 something years. I cut some yards and saved some 25 cents a week till I bought my first harmonica for two dollars, and I still have that one. Was there a lot of music in your family? In my house, my dad just listened to it all the time. He played drums too. It’s just growing up in the environment. [My cousin] Willie Son Gary had a club in Caldwell, Texas and I would go there every weekend driving from Houston. They had this jukebox playing, there would be Muddy Waters, Pinetop Perkins… a whole bunch of guys in the jukebox. Willie Son Gary would pull out his harmonica and play along with the jukebox. That got me into the music. His style was basically a horn style. His harmonica sounded like he was playing a trumpet. I liked that so I started playing like that, to a single note, not too much chord. Then all my blues licks and everything I got them from my cousin T-Bone Walker [laughs]. I loved the way he did his thing on the guitar. What really got me into it, when I was 12 years old my dad and my mother went into this joint, all packed because T-Bone [Walker] was there. They had T-Bone playing guitar and Son playing harmonica. Someone was playing bass drum, just keeping the beat. 1956 was like my date of awake, that’s when I really got serious like into getting off into it. I think it was about a year later, when I was at junior high school, my mother told me I was playing the devil’s music. I think it’s in the genes, like they say. You hear, you like it, you wanna play it. The music kind of does something to you, it makes you wanna play it. How did you experience the relationship between the church and the blues, often labeled as “devil’s music”? I was brought up in church. Every Sunday, my mother, my sister and me we got ready to go at nine o’clock in the morning to church. Sunday school started at 9.45; we will be there to 11. Then from 11 to 1pm, for the evening service we were there… all day long. And I’m doing that now, as a matter of fact. There’s nothing wrong even though you are playing this music [blues]. So how did you develop your singing style? Gospel influence; now I play saxophone every day at church. I prefer not singing because I was singing at church one time and some people were like: “oh, I saw that man Saturday night!” So I shouldn’t be offending like that. I play the saxophone and pulled off the singing. We got a lot of people that can sing. They’re more… if you wanna know where the blues and the soul came from, it came from the gospel church, the black church. If you ain’t got no feeling, then nobody else gets the feeling. At the Continental Club we play jazzy blues, or whatever hits us. I’ve played some R&B tunes also, whatever moves the crowd. But mostly 12-bar blues. Playing both harmonica and saxophone, do you feel like harmonica is more linked to blues and saxophone more linked to jazz? Saxophone also is linked to blues. This guy named Teddy Edwards made this famous statement: “the further back you go in history, the more you know about history, the further you can go in the future.” If you don’t know that much about the history of the music, you’re not going to be able to go too far in the future. So I studied the music, and studied guys like Charlie Parker, Dexter Gordon… a lot of my licks come from these guys. Charlie Parker was a bluesman. If you take his songs and divide them up, go through his changes, those were blues changes. Now, he created his own blues changes and played them super-fast. But I can play some blues on saxophone and play jazz on harmonica. What can you tell me about the blues tradition in East Austin, with clubs like the Historic Victory Grill, Charlie’s Playhouse, I.L. Club…? I wasn’t into the music scene back then for the Charlie’s Playhouse thing. Victory Grill, I’ve played there quite often after it was reopened. T.D. Bell, Erbie [Bowser] and Weldon Gentry were the ones who were here during that period of time. 11th Street was the place to be. There was a club that I am very familiar with and I think a lot of people on this side of town and throughout the world -‘cause we had all kinds of performers coming in- the Eastside Lounge. The Eastside Lounge was a joint. I don’t think the place held no more than maybe about thirty people but the music that came out of there was just phenomenal. And the musicians who came there and play were what I call real, down to earth, blues and jazz musicians. These guys were great! In fact, the Blues Specialists turned out to be like a stepping stone for a lot of guys. Some people might not remember this but I was there from 1987 all the way up to now, and I can tell you that just about every musician that’s made it big in the music field has come to the Continental Club to sit with Erbie and T.D. [Bell], not necessarily me. But they have come to sit in and we tried to accommodate them, and they found real quickly that we played the blues. We had one guy come in and play violin. He played with us for about a year or so. He was good, worked on his PhD at the University of Texas. W.C. [Clark] came and sit in with us, and Kaz Kazanoff. We actually backed up Clarence Hollimon and his wife. Clarence Hollimon was one of Bobby Blue Bland’s main guitars back in the day. We just did a whole bunch of stuff. It can go on and on… we ain’t even talked about our tour! There were some wild scenes back then, man. How do you remember the segregation days? Well, I was an army officer. One day I was on my way to New Jersey driving me and my ex-wife. We were going through states like Mississippi and Alabama. We drove up to this place ‘cause we were hungry and wanted to get something to eat. While we were waiting at the drive-through, these guys came out, stopped right in front of the car, looked at me and my wife and said: “I’m going home and get my gun!” And when they said that we just left our order and didn’t stop till we got to New Jersey, from Alabama we drove straight eight hours! During the sixties I was at school and it was a pretty volatile time. The president got killed, some of our leaders got killed, assassinated. It was just one of those things that kind of made me really get back into my music. As my ex said, I had a real violent temper and so just in order to keep me cool, I would go pull my harmonica and start blowing some tunes. As far as the music scene is concerned, I think more people were really off into the blues back then, because when you turned on the radio stations, especially in Houston were I was, we had the KCOH and the KYOK. Then you had this place out of Nashville, Tennessee that didn’t really come on until like 12 o’clock at night. I’d be upstairs and turn the radio on, catch my blues that way. But the radio station in Houston played the blues all the time. Blues and what we call now “nightclub jazz”, “blue note jazz” like the Jimmy Smiths, Horace Silvers… that kind of jazz that was based on dance rhythms. If you played jazz back then, you got to play something that gets the crowd up and dancing. There were clubs in Houston like the Red Rooster that I went to, and I saw guys like Arnett Cobb. Man, fantastic! I got about all of his CDs right now. The scene was hopping; it was just that it was all black. It’s funny how it all turned around. Now you got your black musicians playing for mostly white crowds. I play music and don’t look at the crowd. Last week we played in Smithville; that was all white. But they had a good time, we had a good time, and that’s what it’s all about. Having a good time doing what you love to do. How do you remember the beginning of the Blues Specialists? When we actually started it wasn’t really the Blues Specialists. T.D. Bell and Erbie Bowser were playing at the Continental Club and I just wanted to hear me some good old school blues. I started listening and I ask could I play with them. I played the whole gig, and when we finished playing Erbie said: “I’ll see you next week!” I said: “I was just sitting in!” He said: “No, you got to come back!” So I came back and I think we played like for two years actually just the three of us, me T.D. Bell and Erbie Bowser. That was a lot of fun. How did you decide the name of the band? How was it to play with T.D. Bell, who for a time was known as “Little T-Bone”? The funny thing about this, it’s like the thing comes around in circle. T.D. Bell, his idol was T-Bone Walker and he played just like T-Bone Walker. We had a family reunion, all the Walker family were there, and we were playing. T-Bone’s son, who was losing his sight at the time, he heard T.D. playing and actually broke out crying. I said: “Wow man, that was moving stuff…” We were playing “Stormy Monday” and T.D. was singing. I was just doing my riffing on the harmonica and Erbie playing the keyboard. How was the current band formed? I’ve been playing with the band since 1987 and Lawrence Bell, who’s T.D. Bell’s son came in just about the same time. So he and I have been playing with the band for 23 years. The other guys… drummer Weldon Gentry kind of played on and off with the band. Weldon was one of the original double shuffle drummers here in Austin, Texas. He started playing back in 1962 with some legendary blues musicians. Rob Richardson, our guitar player, played down at the East Side Lounge and T.D. Bell and I were coming from the Continental and T.D. heard him play and said: “Hey, look Mel you gotta get that guy!” So he’s been with us for like 15 years. And then, one of my church numbers, Russell Shores, the bass player. He was playing at church and I asked him: “Hey, Russell, why don’t you come on down to the Continental Club and play with us?” He said: “Yeah, that’ll be fine.” So he’s been with us for like 8 years. Russell is probably one of our most accomplished musicians because Russell played with the likes of Diana Ross… It’s like everywhere we go somebody hears him play and they want him to play with their band. “Over 200 years of combined Blues playing Experience” - Top L-R: Mel Davis, Russell Shores and Weldon Gentry. Bottom L-R: Rob Richardson and Lawrence Bell. How is it to have been playing at the Continental club for so many years? I got to give it to Steve Wertheimer, the owner of the club. He stuck with The Blues Specialists from day one. Before Blues Specialists, there were times when we go in the club and there was like five people. It gets really hard and you really got to get into your music. Steve stuck with the music every Friday on happy hour and I loved it. I was working during that time at a pretty stressful job, and I looked at that playing music every Friday as my stress relieve. It was my way of getting away from the world, and getting into my own world. 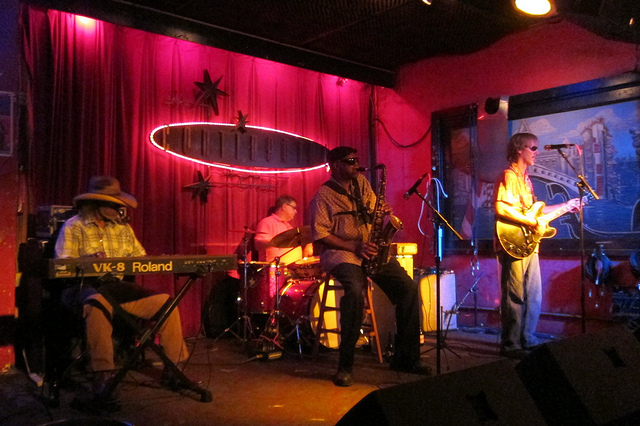 Today Antone’s is probably the most well-known bar for the blues to a newcomer to Austin. What role has it played? The role it has played is big. It was a home for the blues up to just a little bit after Clifford Antone passed. Then they’ve changed their style. I think they put on blues every Tuesday but the club has changed its stripes. It’s not necessarily what you might call a blues joint, it’s a music venue. That’s because in this day and age, in order to stay in business you have to do something that people like and are willing to pay their money to come in and see. That title “home of the blues”, they need to delete that title. You can call the Victory Grill the “home of the blues” but when they got blues playing in it. The other place and I really do think that this is the legitimate home of the blues right now here in Austin is called TC’s Lounge [now the Sahara Lounge]. You can’t even get in there on a Monday. The Eastside Kings play now on Sundays. I’ve played with Clarence [Pierce] and that is good music. I was playing my saxophone and playing with Charles Shaw, Manor, Donald ‘Duck’ Jennings… it was just like sittin’ in with legends. Clarence was the main man to play with Freddie King, “Duck” backed Etta James… they’re older guys and wouldn’t be jumping up playing hip hop music. They’re old school guys and they know their instruments, backwards and forwards. Playing with those guys is playing with legends and that place is actually where you can get the feeling of the different types of music in this town. You got people playing blues, Texas blues, hip hop, R&B… ain’t got nobody playing the Southern Soul just now. You gotta have some lived experience! TC’s Lounge: I don’t necessarily say it’s like the home of the blues, that’s one term I wish they get rid of. Ain’t no home of the blues, maybe there’s a home of good music. But “home of the blues”… the only place where I can put that label on is the Victory Grill. That is where the blues music in this town really got started. I wish it would come back to life, so to speak. What do you think about Austin being named the “Live Music Capital of The World”? Well, I’ve been to other places and they said the same thing! [Laughs] There is a lot of music here in Austin. But certain groups of styles are moving the blues completely out of scene. If you notice the last music festival [Austin City Limits], I don’t think they had one blues musician up there. And SXSW, that’s cool. They got a lot of people in this town that don’t necessarily identify with the blues but they identify with other forms of music. That’s great. I ain’t got no problem with that, but if you gonna call it the “Music Capital of The World” that means you’re including all forms of music. I think if you really wanted to put that label on this town, it would have to be music capital of the world based on its musicians. There are people who still love the blues, you’re seeing that at the Continental Club. We went to Smithsville, the place was packed! People wanted to hear the blues. Now we’re going to Galveston, this is a wedding we’re playing and it’s gonna be over a 150 people there listening and waiting for us to play the blues. We went to my own cousin’s thing at East Texas, T-Bone Walker Blues Festival. You even got the Peterson Brothers, two kids that are playing blues. They sat in with us one time at the Continental and we had fun. The very first one I did was with Erbie Bowser and T.D. Bell, that was called It’s About Time (Spindletop, 1992). I played harmonica and sang two songs, actually. One was called “Don’t Lie to Me”, and the other song was an old song about my cousin, “Cold, Cold Feeling”. We had Kaz Kazanoff playing saxophone, a guy named John Smith also played saxophone, and we had W.C. Clark playing bass, Willie Sampson, who passed, he played drums, and Reggie Carwell also played saxophone. [Later on] I sent my stuff to places that recorded the Southern Soul stuff, out of Atlanta, Georgia, and they wrote back and said: “Well, that sounds nice but that ain’t the style of music we’re looking for…” I’m playing 12-bar blues and they want to hear this X-rate, I guess it’s my church experience! We we’re selling CD’s at the Continental and we thought we were really hittin’ it. But nothing came through, so we decided to go and play at SXSW. Now, that music festival is probably good for a lot of musicians around here, but they had us playing and we were supposed to open up for Ike Turner at Antone’s… Well, about a few hours before they opened up the schedules, somebody called me up and told me the venue was changed. You’re gonna play at some other club. We went to this other club and they moved time until like 12 o’clock. The band before us was playing country & western, the crowd was into it and then we had to play some blues after this. So they made us change from Antone’s, which we probably would have had a nice little crowd, all over here. We ain’t doing this no more. We had five people listening to us play. That’s when I got this brilliant idea, I’m gonna start my own record label. If nobody gonna sign me, I’m gonna sign myself. So I started the label and named it after my granddaughter, Ariel Records, and we released like 4 CDs. One is It’s About Time Again where I kind of redid the songs that T.D. and Erbie did with a different group because T.D. and Erbie had passed by that time. We did another one that was N2Deep (2001) which is all original songs that me, the guitar player, and a friend of ours wrote. Then we did another CD called Uptown Woman (2003), with more original songs. Then as another thing I actually recorded a live CD at the Victory Grill. The CD that did the best was N2Deep. It was pretty nice. All this stuff is coming out of my pocket. I’m sitting there producing it, making my own covers, doing my own duplication so the CD, packaging… I was my own production company, and we sold everyone that we made. But it’s a lot of work. I’m trying to write new music, produce it, play it… I still like to play tennis… So I stopped the whole thing. Right now we’re ready to start a new CD, all originals. I got another group called The Three Sounds, with Lawrence playing keyboards and a guy named Mr. B. playing drums. I’m playing saxophone. It’s what I call smooth blues. It’s blues you can kind of sit back in, be in your corner and enjoy. It’s laidback. We’ve been working on that for the last year. Do you think music is appreciated differently in Europe? Well, my cousin T-Bone went to Europe and the statements that I heard from my mother and my father were that he felt more respected over there than he did in his own country. People appreciated the music more. I did have a chance to go to Europe myself… we played in a big blues festival in Holland in 1992 [Samson Blues festival in Utrecht –web info]. That’s when we we’re really happening, we got nominated for a W.C. Handy award. T.D. [Bell] and Erbie [Bowser] actually played at Carnegie Hall, we went to Washington D.C., played a festival in Arizona… just played all over the place. In Holland the place was packed with five thousand people in it. All they wanted to hear was the blues, don’t come out there with no blues-rock or no hard-rock and call it the blues, you’d probably come out booed out of that. They had some Muddy Waters old guitar player, Little Milton, Hank Ballard & the Midnighters, Blues Boy Hubbard with the Eastside Kings, and they had us, T.D. Bell and Erbie Bowser. It was straight-ahead blues musicians and we all basically played the I-IV-V blues changes. I was checking that out the whole time we were there. They may have different bass riffs or different rhythms but they all basically played I-IV-V blues roots. Do you have any lifetime favorite musicians? Well, I’m keeping it in the family. I got the whole collection by T-Bone Walker. The music was just so smooth. I got to say T-Bone Walker is the artist I listen to the most. Saxophone, I listen to Arnett Cobb all the time. He had that energy in that saxophone playing. If I had to say I had to listen to just two guys, it would be T-Bone Walker and Arnett Cobb. Erbie Bowser played with Illinois Jacquet’s band. And Joe Houston, he was from Austin. We actually opened up for him downtown. He played the alto saxophone, he was great, a lot of energy. There was a lot of good saxophone players in Texas, though they probably didn’t stay in Texas. Larry Williams came to Texas primarily because he thought the music scene was something you could jump off into. James Polk is a good saxophone player. I was talking to him a couple of Sundays ago at church. I’m playing saxophone and he told me: “You know, I used to play alto…”, “I know you did, I used to see you all the time!” He’s a very talented musician. He’s good. One of these days I’d like to hook on with him. I’m learning from a bunch of new musicians on the scene now. They’re good too. How different is Texas blues compared to other blues styles like Chicago, New Orleans…? You look at T-Bone Walker, he was a more up-tempo, ensemble type thing where he had more than just guitar, harmonica, bass and drums. He had horns incorporated to his music. He sure had saxophone in his. I just think that blues will be here forever regardless to what a lot of young people say. You listen to hip hop, hey there’s blues in there too. I take my music to a different level by incorporating a lot of the other musics like the R&B. R&B –they say rhythm and blues, to me is blues. If you want to talk about the kind of music you hear on local stations; that’s called southern soul. A lot of it is X-rated. I distinguish that from blues. We opened up for Bobby Bland and for Willie Clayton; two distinct sounds coming out of each of those groups. Bobby Bland: contemporary blues; Willie Clayton: southern soul. Now, I’m working there with the Blues Specialists and we’re playing our own style of Texas-style blues. R&B I would associate with guys like The Temptations, Teddy Pendergrass, Aretha Franklin… Blues I associate it with Blues Boy Hubbard, or even W.C. [Clark] in his early days. But W.C. has kind of gone -excuse me W.C.!- back to the R&B roots. He does a real good job in one the songs that Al Green does. I love it! Is that the power of the blues? That it’s always the same but it’s always different? You can do a lot with the blues changes. Some of them, when you listen to it may not even sound like the blues but it’s got that basic I-IV-V change somewhere in there or II-V-I. Blues and jazz are right in there, man. R&B is more eight-bar, sometimes a four-bar structure. And you listen to some of the southern soul, some songs have no change, it just got one chord. I did a lot of the stuff on my own. My mother said that I had like a photographic memory. I read books about music and picked it up. I taught myself how to read and compose the music… and I’m still learning. That’s one thing I learnt from T.D. Bell. T.D. at the age of 75 was still learning. He played a song called “Honky Tonk”. He used to do this thing in the riff in the song moving the hand up and down. Well, some guy, a teacher in town, said: “why you’re doing all that, you just have to do this here and do the same thing…” And T.D. picked up on that. He was one of these guys who played the guitar on the down stroke; other guitar players play it down-up, down-up… But T.D. had to be fast! So just before he passed he was learning how to do that up-and-down thing so that he could be even faster with his licks. That just told me you’re never too old to learn about the music because there’s so much stuff out there that you just got to keep renewing yourself so to speak. I’m still learning, I’ll probably be learning till the day I die. What relationship do you see between different Black music styles like blues, jazz, soul…? Blues came first, as far as I’m concerned. Jazz came out of it. You go back to the days of Louis Armstrong, when he first picked up his trumpet. A guy named Buddy Bolden was actually the first guy who really started the whole blues-jazz thing. Louis Armstrong kind of carried that torch down. Louis Armstrong played the blues. Now, he incorporated some of his style into the blues playing but he also stuck with the basic. The thing about the blues, it was more of a feeling. You can get guys that know their instrument up and down, they can play every scale and every arpeggio that you can think of, and play it fast and do it real good. But the difference is that you can actually play a two-note song and make it sound so pretty; that’s the blues. Slow down so people can dig what you’re doing. When you look at the notes that a bluesman and a jazzman play they are pretty much the same, it’s all how you put on them into the music. Can blues still be considered black music? Be considered? Blues is black music. Ain’t no considering about, blues is Black music. As far as the music is concerned it is Black music. Me and Clarence [Pierce] were talking about the ownership and we don’t own nothing anymore, but it was originated by Black people. This interview was conducted during fall 2010 as part of an ethnographic research about Austin’s blues scene. The Blues Specialists - Green Onions.